The other day I found The Lord of The Rings on basic cable, and I thought it would make a nice background noise, and provide an occasional distraction from my attempt to handle some long neglected Saturday chores. Something did in fact quickly distract me. 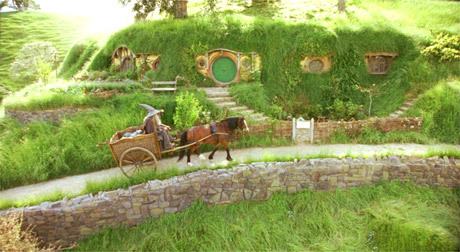 During a scene placed in “The Shire” it occurred to me, we could learn much from the Hobbits in regard to sustainability. A harmonious design with nature, the Hobbit’s Shire is constructed with as little impact on the lush green rolling hillsides as possible. In fact, it almost takes a second look to see that the that houses actually exist. Based on my brief research on Hobbits (watching the movie) I didn’t appear that electricity existed. But if it did, their energy costs would be greatly minimized by their sustainable concepts. Built into the hillsides, the grass covered cottages would provide warmth in the winter and cooling in the summer. The roads and paths were kept to a minimum width using only porous paving material such as stone or simply dirt, absorbing rainwater therefore requiring no need for a storm water system. Because trucks and petrol were not an option, the Hobbitians (?) would have to rely on building materials from local sources, their food, raised and grown within close proximity of town. No utilities, cars, or industrial pollution would mean clean water systems, and with little to no rain water run off, an endless supply for the water cycle. There is in fact a community I found as inspired by the Hobbits gentle and earth friendly approach to housing development. Although not quite as thorough, “The Shire” in Bend, Oregon is a sustainable housing community inspired by J.R.R. Tolkien’s infamous imaginary village. The homes come in a variety of English Country Village Architecture, all offering green building products such as Lifebreath HVAC systems, radiant floors, SIPS roof panels, as well as working with Energy Star and Earth Advantage Building Programs, which provide leading edge technology for energy and technology. 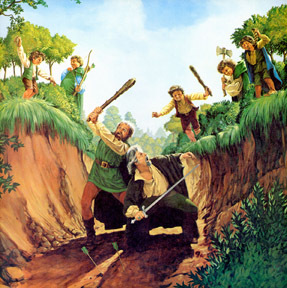 So hats off to Frodo and the boys, real or not, as humans we can learn from the Hobbits.